BERLIN (Reuters) - The European Union is ready to give Britain more guarantees that the Irish "backstop" is only intended to be temporary, the bloc's chief Brexit negotiator said on Friday. 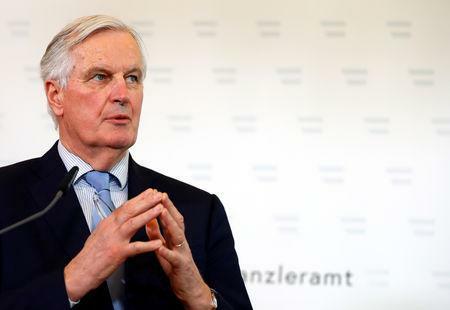 "We know that there are misgivings in Britain that the backstop could keep Britain forever connected to the EU," Michel Barnier said in an interview with Germany's Die Welt newspaper to be published on Saturday. The backstop, an arrangement designed to prevent the return of "hard" border infrastructure between EU member Ireland and British-ruled Northern Ireland if there is no trade deal after Brexit that makes it unnecessary, has become the main point of contention in the proposed Brexit deal. "We will not reverse the backstop," Barnier added. "It's an insurance. We don't want to make use of it. And this is also the case when you insure your house. It's only intended for the worst-case scenario." British Foreign Secretary Jeremy Hunt said last month that the key to securing a Brexit deal that the British government can get through parliament was to define the "temporary" nature of the Irish backstop more precisely. Prime Minister Theresa May has said that, if British lawmakers once more reject her withdrawal agreement in a vote due to take place by March 12, they will get to vote on asking her to request that the EU delay Brexit. Barnier said EU guarantees that the backstop is temporary could come as part of the political agreement setting out expectations for Britain's relationship with the bloc after it leaves. He told Die Welt that any extension must be intended specifically to solve the impasse. He added that he saw little risk of the remaining 27 EU leaders opposing a delay to Britain's exit, currently set down as March 29, as long as Britain was serious about finding a solution. "The question that the EU27 will ask is: What (is it) for? The answer cannot be that Britain wants to postpone a problem. One would want to solve it." He added that any decision to allow an extension would have to be unanimously approved by EU leaders at a summit on March 21.